The last news about Terra, upcoming CGI animated sci-fi movie. Watch the trailer. Terra is an upcoming science-fiction CG-animated movie directed by Aristomenis Tsirbas who also cowrote the screenplay with scriptwriter Evan Spiliotopoulos. 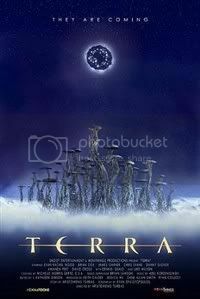 The movie Terra should be released in Autumn 2008. Terra isn't the usual candy cartoon: with Terra there is a real plot, with strong characters. The plot of Terra even pose some difficult philosophical questions, requiring the characters and the audience to make tough ethical decisions. during the last Toronto International Film Festival. "Mala (Evan Rachel Wood) is a young alien girl living a peaceful village life on the planet Terra when a strange ship appears in the sky. The alien creatures are perplexed by the sky ship’s presence, until a squadron of attack cruisers violently abduct a number of villagers. Running to escape an attacking vessel, Mala tricks the pilot into crash landing and investigates the wreck, finding a strange injured creature. I think that bringing one's children to this movie is a real good idea. Children will not only be entertained but also they will be educated, to a certain extent.